Mr. Koontz or Kountz, as his name was sometimes spelled, also had property at the entrance to Perry Park or Pleasant Park, famous for the haystack-like rock formations, called the Haystack Ranch. He was a pioneer in the area coming to the county in 1859 or 1860. John Koontz raised working and beef cattle; he was a grange member and helped to organize them. In politics he was a Republican. According to the 1879 census Mary was John’s wife and they had one son named Samuel. 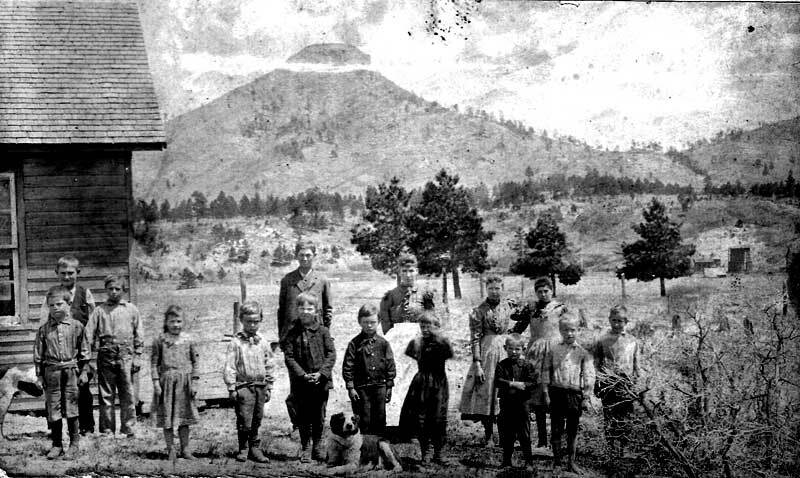 After selling his land to Carr Lamb the Koontz family moved to Aztec, New Mexico. 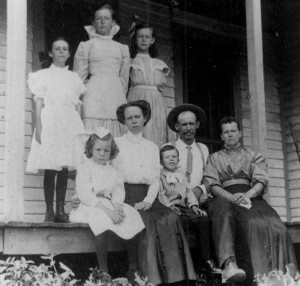 This photo of the Carr Lamb family was taken about 1905 on the porch of the family home and they are front row (L -R) Jennie, Gertrude, Fred, Mr. Carr Lamb, Mrs. Ann Lamb. Back row; Hildred, Grace and Helen. Soon this couple set up their own home in the Perry Park area and had seven children. After some years they purchased a 400 acre ranch and built their own home, which is still used to this day. The ranch was farmed and was run as a dairy ranch. The Lamb’s acreage grew to 720 over the years. Carr registered his L/L brand in 1884. 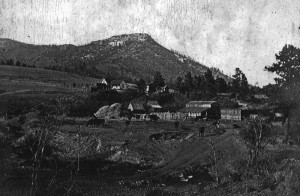 Photo of the Lamb ranch was taken cira 1900. The house is on a hill above the barns to the left of center. notice the cows and Raspberry Butte. The children were; Gertrude born 1893, Edgar born 1894 (He died in 1895 of Cholera,) Grace born 1896, Helen born 1898, Hildred born 1899, Fred born 1901, and Jennie born 1903. All of the children attended the first Larkspur school, which was on the Lamb ranch off Fox Farm Road. The building was later moved into the town of Larkspur on skids. 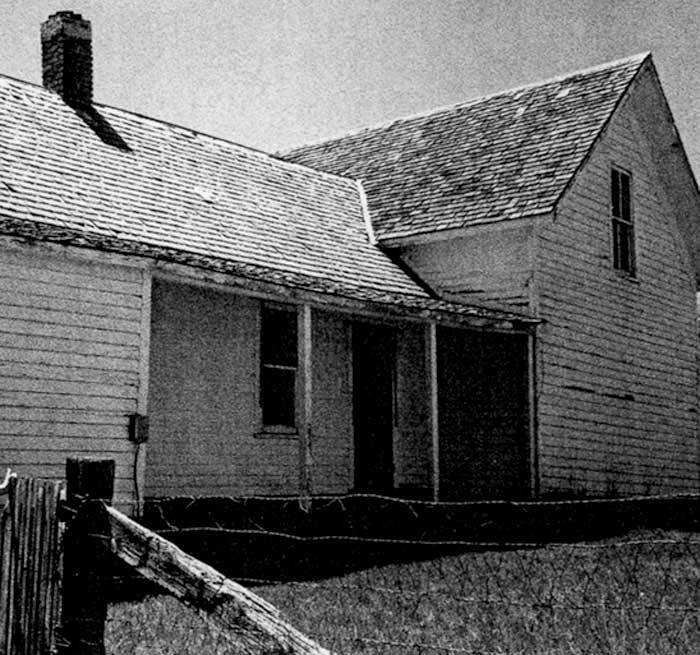 Here we see a corner of the first school in the Larkspur area, photo circa 1900. The school was built in 1884 and moved with the use of skids in 1890 into the village of Larkspur. The names of these children are not known. 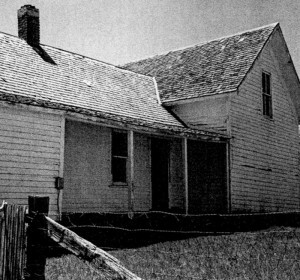 This modern day photo of the Lamb house shows the porch where the family had their picture taken. The house was built around 1900. The newspapers also tell us that after an illness of four months Anna Lamb passed away in 1918. Seventeen years later, in 1935, Carr also passed. Their daughter Hildred and her husband Jack Warwich continued to live on the ranch. In 1947 it was Carr’s youngest daughter, Jenny, and her husband Harold Best who kept the ranch going operating it as a dairy farm. Thanks to the Colorado Historic Newspaper Collection, U.S. Census, the book “Our Heritage the People of Douglas County, Betty Prince and Ida May Noe History Collection.